The Casio FX 83GT+ has been the UK’s best selling scientific calc…and deservedly so. It’s been setting the pace in many UK schools and is the first choice for GCSE exams for many students. But now there is an alternative…… It’s the Logik LK 83XP which has almost all the features of the FX 83GT Plus (no verify or recurring decimal) and with one big advantage…… it’s dual power. This combination of battery and solar power prolongs battery life and gives extra reassurance for your students when used in exams. The LK 83XP has a THREE year guarantee* and is suitable for all exams where a calculator is allowed. Features include: 252 functions, “natural (true) display,” check, correct and replay, stats. calculations, prime factorisation, hard plastic keys, slide on case, etc. It’s a calc which can see your students all the way from year 7 to GCSE and at a surprisingly modest price, from just £5.25 ex vat. To book a place please visit www.debatechamber.com, call us on 0800 810 1058, or email info@debatechamber.com. Places will be allocated on a first come first served basis. Our Maths Summer School offers bright and aspirational students the opportunity to study a variety of advanced topics in pure and applied mathematics that are not typically covered by the school syllabus. The course is particularly appropriate for students who may be considering further study of mathematics, but is also a great addition for those interested in related disciplines, such as physics, computing or engineering. This Summer School offers the chance to explore some of the most exciting ideas in contemporary mathematics. As a general structure, students will develop a theoretical understanding of a particular branch of mathematics in the morning session, before exploring the practical applications of these ideas in the afternoon. Classes are small, typically containing twelve to fourteen students, all of whom should have a passion for mathematics, a curiosity to build on their existing knowledge and be keen to embrace and exchange new ideas. Classes will focus on problem questions and exercises, creating a comfortable environment for students to share ideas amongst their peers and to progress from their existing knowledge toward more challenging material. The Mathematics Summer School will be held in late July 2019. You can find detailed schedules, available dates, costs, student reviews and tutors on the course webpage – here. Debate Chamber is committed to ensuring that financial circumstances do not prevent any student from attending our events. For details of how to apply for bursary funding, please see here. The Mathematics Summer School will be held in late July 2019. You can find detailed schedules, dates, costs, student reviews and tutors on the course webpage – here. The Casio FX 85GT+ and the Logik LK 83XP are excellent choices for your GCSE maths students. They both benefit from battery power with solar power back-up to provide extra reassurance for your students. Both calcs have a “natural display” function which enables students to enter expressions and data as shown in textbooks. As you would expect the build quality of both calcs is excellent and both calcs benefit from a THREE year warranty. (excludes damage to the LCD). World of Maths goes into schools to host maths days. We offer your pupils interactive, exciting, hands-on, problem-solving activities. Our Maths days comprise unique displays and activities designed by qualified maths teachers. We run 34 different activities each year, so no two visits to your school will be the same. Activities cover a variety of Maths topics, and most activities relate to real-life situations. Students are kept fully occupied in small groups with worksheets to write down their answers. An 8 page answer/follow-on booklet supplied. We are now taking bookings for the 2017/2018 academic year. Should you be interested in booking please email or call me. There is also more information on our website at www.worldofmaths.co.uk. How would you like free maths kit when you order scientific calculators…..? For 22 years I was a secondary school teacher working in inner London…….. and during this time one of the most frustrating aspects of my job was students who turned up for lessons without the right kit. Sometimes it could simply be a pen they’d forgotten or, on one occasion (when I was working in a south London school) five minutes before the start of the GCSE maths exam, one of the candidates asked me if he could borrow a calculator ! So where does the free maths kit come into all this ….? There’s a product called the “Value Maths set” which contains the basic equipment needed for most maths lessons …. it’s not only reasonably priced but can be a big help for both students and teachers in avoiding the disruption which may be caused when some students turn up for their lessons without the right kit. From just £ 1.25 each, (ex vat) it contains a metal compass with half pencil, two good quality black ink pens, eraser, sharpener, 15 cm ruler, protractor, and a full length HB pencil…. All packed in a handy “exam friendly” clear PVC wallet with a zip slider. The LOGIK brand of calculators has been used successfully in primary and secondary schools during the past fifteen years. 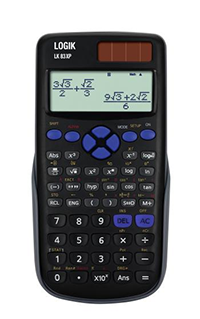 If you’re considering scientific calculators for the new school year then their two “flagship” models, the LK 183 and the LK 83XP are well worth considering. Both calculators have a THREE year warranty (excludes damage to LCD) and are suitable for KS 3, 4 and GCSE. Both calcs come with hard plastic keys, a slide-on case and all the features and functions your students will need for GCSE maths. From only £ 3.69 each (ex vat) both calcs are also available in class sets of 30 in a Gratnells storage box with a foam insert and handy clip on lid. Want your teaching life to be better? Are you fed up with large classes? Are you fed up with work overload and long days? Are you fed up with your low pay? Are you fed up with all the administration and data uploading? Are you fed up feeling so tired and stressed? Are you fed up with the weather? Sign up and login for free at uTEACH WORLDWIDE today. Then for a small monthly fee you can upload your teaching profile to receive opportunities from some of the best international schools in the world. Your decision today could change your life forever. What’s the simple and cost effective way to help maths lessons be more productive, both for teachers and students? FREE GRATNELLS STORAGE KIT * for the maths and science departments …..
Gratnells are the leaders for storage containers in schools, colleges and universities. Their products are designed to make life more efficient both for teachers and “back room” staff, particularly in the maths and science departments. Did you know that right now, until July 31, when you order selected calculators from Signpost Educational Ltd., you will receive Gratnells boxes completely free of charge! For every 30 LK 183 or LK 83XP calculators you order* you will get a free Gratnells storage box, foam insert and a clear lid. There’s a minimum order of 60 calcs (that means you’ll get two boxes, two foams and two lids free of charge) but you must quote the code NIVRAM to benefit from this offer. We understand that the firm holds good stocks of these products and usually delivers within 1-3 days of receiving orders. Can this calculator take over from the Casio FX 83GT Plus …..? 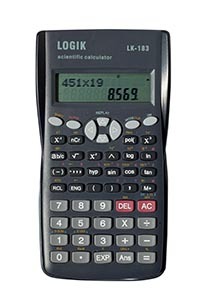 The Casio FX 83GT+ is the UK’s best selling scientific calc…and deservedly so. It’s been setting the pace in many UK schools and is the first choice for GCSE exams for many students. But now there is an alternative…… It’s the Logik LK 83XP which has almost all the features of the FX 83GT Plus (no verify or recurring decimal) and with one big advantage…… it’s dual power. This combination of battery and solar power prolongs battery life and gives extra reassurance when used in exams. The LK 83XP has a THREE year guarantee* and is suitable for all exams where a calculator is allowed. Features include: 252 functions, “textbook (true) display,” check, correct and replay, stats. calculations, prime factorisation, hard plastic keys, slide on case etc. Guided only by their feelings for symmetry and simplicity, creative mathematicians are inspired by the art of mathematics rather than by any prospect of its ultimate usefulness. And yet, we live in a world in which mathematical ideas find application in almost every branch of human knowledge. Since ancient times, the puzzles, problems and challenges that arise from mathematical thought have shaped the way in which we interpret both the physical and the spiritual. In a rapidly changing technological world, mathematics remains as critical as ever to our scientific, philosophical and mechanical endeavours. Linear Algebra: vector spaces, linear independence, matrix mechanics, eigenvectors, Leslie matrices, Google PageRank algorithms and encryption. Differential Equations: Linear and non-linear differential equations, first and second order differential equations, population growth, financial markets, radioactivity and quantum mechanics. Series: convergence, divergence, comparison tests, harmonic series, Taylor series, estimating pi and the Riemann-zeta function. Calculus: limits, differential calculus, integral calculus, formal definitions, the fundamental theorem of calculus, applications. Proofs and Algorithms: proof by induction, proof by contradiction, graph theory, randomised algorithms and recursive algorithms. Set Theory: natural numbers, integers, rational numbers, irrational numbers, real numbers, algebraic numbers, transcendental numbers, counting infinities, cardinality, power sets, Cantor’s diagonalization argument, paradoxes. Cryptography: substitution ciphers, public key cryptography, RSA algorithm, modular arithmetic, code-breaking. The Mathematics Summer School will be held at University of London venues in Bloomsbury, Central London, and is open to students aged 15 – 18 who have completed a minimum of AS-Level Mathematics (or the equivalent in another qualification structure) at the time of the course. The summer school will take place on 17th – 21st July (and repeated 7th – 11th August and 21st August – 25th August) 2017. You can find full details of schedules, dates, costs, student reviews and tutors at http://debatechamber.com/project/mathematics-summer-school/. To book a place please visit http://debatechamber.com/project/mathematics-summer-school/, call us on 0845 519 4827, or email info@debatechamber.com. Places will be allocated on a first come first served basis. KS4 problem solving videos from Doddle Maths! Get your KS4 students solving problems with ease thanks to tablet-friendly video content from Doddle Maths. Test their algebra, geometry, and number skills with videos on unknown powers, the area of shapes, sharing out money, and much more. These audio-narrated, step-by-step videos talk through the process of approaching and solving a problem in an engaging real-life context. Students are shown exactly the sorts of workings-out that should be visible on their own page. We’ve all heard it: “What’s the point of learning algebra? We’re never going to use it after we leave school!” Too many young people fail to see the purpose of learning Maths and subsequently become disengaged with the subject. We’ve built Panjango to give learning context and purpose by demonstrating the many exciting applications of Maths (and English and Science) in the world of work. You are tasked with designing a ‘level up’ system for a new computer game. The system should be based on experience points. You decide that each level’s required experience points can be worked out by doubling the previous level’s experience points and then subtracting 100 times the level the user is currently on. The first level requires 400 experience points before the user can progress to the second level. How many experience points is the fifth level going to require? You are planning an aid drop. Each air freight pallet has a length of 2.1m and a width of 1.6m. Items can be safely stacked to a height of 0.8m on the pallet. The aid drop is delivering first aid kits on the first flight. These kits each measure 35cm by 40cm by 10cm. In order to plan how many flights will be required to deliver the necessary aid, you need to know how many first aid kits can fit on each pallet. How many first aid kits can fit on one air freight pallet? Panjango, which is free to use, features more than 1000 contextualised challenges across 120 different occupations (covering curriculum levels 3 to 7). Our new filtering system allows you to tailor your lessons and present the challenges most relevant to your class. For example, you could display challenges set at one curriculum level e.g. all Maths topic at Level 7 to broadly explore the context and purpose of Maths; or you could display challenges relating to a specific topic such as algebra, geometry, or probability to help bring a specific topic to life for your students. To help give your learning context and purpose, register now for FREE at panjango.online. Thank you for joining us on our journey to connect learning to life! The cost of the five-day course is £475, and will be held at the University of London in Bloomsbury (please note that these courses are not residential, and accommodation must be arranged independently if required). The course will be held on the 17th-21st July and repeated 7th-11th August and 21st-25th August. Doddle KS4 Maths helps you to keep tabs on your students’ progress with a huge variety of targeted quick tests. Self-marking, formative quizzes check your students are confident in their knowledge of fractional indices, using units, compound percentages, and much, much more. Detailed recap slides instantly correct students and address any gaps in their understanding. Score breakdowns automatically feed into your markbook, enabling you to diagnose weaknesses easily and personalise your feedback and support. Find out more about Doddle’s interactive resources, homework quizzes and automatic online markbook by booking a free in-school visit with one of our Educational Consultants. ATM welcomes everyone, from all levels, with an interest in mathematics education. Join and become part of a community of mathematics educators which access to stimulating activities, thought provoking research and genuine good practice in the classroom. As a member of ATM you will gain access to a wealth of support, information and ideas. You can join now by Direct Debit in 10 instalments for a full years membership, and instantly access the full library of journal articles, plus all the other benefits that membership brings. That is just ten monthly payments of between £2.50 and £7.00 (depending of the membership type selected. ATM membership is for anyone who has an interest in the teaching and learning of mathematics. Personal members receive their own individual copy of the *MT journal (five per year) in addition to access to the extensive library of electronic journals dating back to issue one, containing thousands of interesting and useful articles to use in your teaching. Members also have access to the member-only resources, a 25% discount on publications and considerable further discounts on events and conferences. *e-membership provides a greener alternative for our members by operating on a purely electronic basis. Sign-up today and receive instant online access to all ATM member-only benefits. ATM also has a full range of high quality publications that are written by teachers, for teachers. ATM Resources with activities for problem solving, reasoning, collaborative working, developing independence and much more…. Practical advice and activities on how to use origami with learners while offering opportunities to thinks creative, justify decisions and opinions and deepen understanding and reasoning. A collection of meaningful projects for the Secondary classroom that encompass collaborative problem-solving while promoting discussion and engagement. This ATM best seller is a photocopiable book containing sets of group problem-solving cards to challenge and develop reasoning in the classroom. A fantastic book for KS1 and 2 containing activities to encourage chilldren to think by themselves or in a group and comes with a PDF of resource cards and activities to use alongside the problems. See the full Publications Catalogue that feature some ‘flavour of…’ activities as well as our most popular resources. You can also view all our resources in the ATM online shop. Members of ATM receive discounts on resources as well as all the other benefits of membership. The LOGIK LK 183 calc. has been used by UK school and college students since 2008. With 240 functions, plus twin line display, auto power off, hard plastic keys and a slide-on cover, it has proved to be extremely reliable as well as being competitively priced, (from just £ 3.49 ex vat). Both LOGIK calcs have a THREE year warranty (excludes LCD damage) and are suitable for KS 3, 4 and GCSE. PS. Also available is the “Value Maths set” which has proved to be very useful for students in lessons and exams……from just £ 1.10 ex vat. Details on the website. What is the best way to encourage your students to reason mathematically and solve problems? The new National Curriculum in Mathematics has at its heart an active, process-orientated delivery of the content; greater emphasis is placed on reasoning and problem solving. These teaching materials will supplement your chosen textbook and provide your pupils with the opportunity to think for themselves about developing a mathematical strategy to fit a given activity. Each topic contains: details of the mathematical content covered; a pupil’s target achieved/progression sheet, lesson plans; worksheets; assessment. A section providing answers to all worksheets is provided at the end of the book. Selected Topics in KS3 Maths is available as a photocopiable book or on CD Rom, and individual activities can thus be readily copied and distributed to students as required. The copies can also be shared with colleagues or given to supply teachers, without any fear of the original book being misplaced. When ordering the book please quote the reference T1678EMN. FAO the Head of Maths – Work Less. Boost Results. I used to work hard: 12-14 hour days, 7 days a week. But the results of my students did not improve until I did less – a lot less. This is because I created a revision program that was “self-taught”. It showed students how to revise for their upcoming GCSE maths exam (in a step-by-step manner) from day 1 right up to the day of their exam. The best part about it is, my program didn’t require me to be there and hammer-home the key concepts. Since I put it into place, my workload has reduced by 50% yet the results of all my students have improved considerably. If you want to reduce your workload significantly and boost your student’s results in the near future, I highly recommend that you get my unique revision program from: www.gcsemathsforschools.co.uk.